All the restaurants with an asterisk (*) after the name and the text "Looking forward to eating here." at the end of the note are places I would like to visit that friends, blog posts, articles, TV shows, etc. recommend I eat. Note: All restaurant addresses link to Google maps. 2 Amy's Neapolitan Pizzeria is a bustling wood-oven pizzeria serves innovative Neapolitan-style pies and Italian wine by the glass. They were the first certified Neapolitan pizza place in the United States. Their wood-fired pizza is the best, but their side dishes are even better. The meatballs cooked in the wood-fired oven are fantastic along with the rabbit stuffed with baby broccoli rabe and many more items that change with the season. A. Litteri's is an old-school Italian grocery store and deli drawing foodies for meatball subs, homemade sausages and more. Their selection of pasta, olive oil, etc. are vast. The main reason I have been going back is for their cured Italian meats along with the service. The other things I have been known to order is their meatball sub, but my favorite is the create your own cured meat sub. When I order my sub with all the extras, it costs me about $13 or $14, but it's enough for two or three meals. American Eats Tavern * Looking forward to eating here. At American Eats Tavern renowned chef José Andrés pays tribute to America’s culinary legacy, celebrating some of the country’s most iconic dishes and incorporating a delectable array of native ingredients. NOTE: They have multiple locations. Amsterdam Falafel serves Falafel with pita bread plus Middle Eastern salads and Belgian fries at the late-night quick-serve eatery in Adams Morgan part of Washington, DC. You can get a large or a small Falafel. The difference is the small has three Falafel balls, and the large has five. Once you have chosen which you want you can pile on the extra ingredients until there is no more room. I suggest crushing the Falafel balls to make more space along with it allows you to spread them out inside the pita bread. NOTE: They have multiple locations. Baan Thai * Looking forward to eating here. Baan Thai is a restaurant specializing in Northern Thai fare and sushi, alogn with cocktails, in a lounge setting. Baked and Wired is an artsy neighborhood bakery and coffeehouse supplying espresso drinks, big cupcakes, and signature granola. My favorite cupcake they make is the DOOM which is dark chocolate moist cake with dark chocolate fudge-like frosting. The thing to ask for is if they have cake tops which are all the trimmed cake tops from the bakery with a thin layer of frosting between them. Or maybe one of their ice cream sandwiches during the summer. Beefsteak is a fast-casual chain from José Andrés' restaurant group specializing in flavorful veggie and grain bowls. If more restaurants made vegetables like this, I would eat more of them. I ordered their beetsteak burger which is a vinegar marinated half an inch to three-quarters of an inch sliced golden beet on a toasted roll along with their special sauce some lettuce greens. Or order their beefsteak tomato burger which is similar to the beetsteak burger. The other thing I ordered was their gazpacho salad which was a bunch of different greens, nuts, etc. and then cold soup poured over everything. NOTE: They have multiple locations around the DC area and a few other national locations. Ben's Chili Bowl is a historic spot attracts locals and celebrities for the spicy hot dogs, chili-cheese fries and milkshakes. The thing to order is the chili half smoke (half pork and half beef sausage) and an order of chili cheese fries. The chili cheese fries are big enough two people can share. NOTE: They have multiple locations. Big Bear Cafe serves new American restaurant with a casual interior and patio serving breakfast, lunch, and candlelit dinners. I've been there on weekends for breakfast and tea. It's a nice and relaxing place which has no wifi on the weekends or nights if memory serves me correctly. Billy Goat Tavern * Looking forward to eating here. Billy Goat Tavern is the DC outpost of a famed chain of pubs founded in Chicago in 1934 known for its burgers and breakfasts. The Chicago one is famous for being part of the recurring SNL skit Cheezeborger, cheezeborger'. Bread Furst is a bustling bakery and kid-friendly hangout offering gourmet bread, pastries, cakes, coffee and light fare. Bread Furst, is committed to offering you breads, desserts, and foods with character. Food that they love and are proud to share with everyone. I have not had a bad thing there ever. Bub and Pop's is a warmly decorated nook serving up handcrafted hoagies and unique pickles, along with soups and salads. You should order the Bub’s Italian Hoagie which contains Genoa Salami, Prosciutto, Capicola, pepperoni, aged Provolone, arugula, Roma tomatoes, Hoagie Relish (hot peppers, sweet peppers, pickle, and onion), mayo, Bub’s Vinaigrette, and Pecorino Romano. Or get the meatball sub if they have it on special. Or even the Roast Pork Philly Special where the broccoli rabe is sauteed with hot cherry peppers. Buffalo and Bergen from bagels to Knishes to egg creams this place has them. I've eaten a few of their Knishes, and I like the Ruben Knish, the cheeseburger Knish, the pastrami Knish, and a few more. Haven't gotten to their bagels yet but they look great too. Buttercream Bake Shop is a popular pastry chef's lovely pink haven for artistic baked goods and decorative cakes. I ordered a cheddar cheese and ham scone which I ate a day later. The scone was light, tasty, and moist still. I also purchased a home-made Hostess Cupcake which was terrific. Carl’s Subs * Looking forward to eating here. Carl’s Subs is a cash-only carry-out. 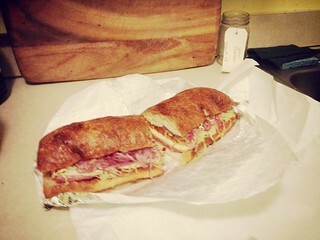 Carl’s cranks out oversized sandwiches stacked with cold cuts (peppered ham, mortadella, and capicola figure prominently), cheese (American, Provolone, and Swiss), along with ungodly amounts of mayo and ample amounts of hot peppers. Carving Room * Looking forward to eating here. Carving Room is a hip joint with a patio serving cured and carved meat sandwiches, craft beers, and innovative cocktails. The items you need to order are the pastrami sandwich, chorizo cigars or the cigar sampler plate. Chaia's 'farm to taco' is a unique relationship between farmers and urban street-style food. Chaia offers seasonal, plant-based tacos, sides and natural drinks in a stylish, casual setting. Charcoal Town Shawarma * Looking forward to eating here. At Charcoal Town Shawarma you can smell the charcoal-grilled kebab from the patio and hear it sizzling as you walk through the door. The herb-packed falafel is served burrito-style, wrapped in a thin pita wrap versus a more traditional, doughy pita pocket. It’s briefly grilled, creating a crisp outer layer, and comes topped with tahini sauce, diced tomato, lettuce, mint sprigs, lemon and pickled turnips. Chinatown Express is a family-run Chinese joint serving handmade noodles (spun in front of the window) and dumplings. The reason I go here is they hand pull their own noodles. Which is done by an older gentleman that is probably in his 70's. I order the pork fried noodles and an order of some kind of dumpling. The Coffee Bar * Looking forward to eating here. The Coffee Bar is a cozy, rustic-chic spot featuring elevated coffee drinks, a patio, and locally made bagels and pastries. They're all about the experience, whether it’s your morning coffee or afternoon tea. The Coffee Bar sources the best beans and delivers them to you with great service and a cozy atmosphere. NOTE: They have multiple locations. Comet Ping Pong is a hip crowd eats pizza and wings while playing Ping-Pong and listening to bands in warehouse-chic digs. You need to order the wood-fired meatballs as an appetizer if nothing else. Compass Coffee is an airy, modern, industrial cafe and roaster offering artisanal brews, pastries, sandwiches and more. They have excellent wifi and wonderful hot chocolate. NOTE: They have multiple locations. Cucina Al Volo is a pick your pasta and your sauce place. To eat in or take home. Everything is handmade, from scratch. You need to try the lamb ragu or the rabbit ragu or even the wild boar ragu if they have them available. I usually ask what fresh pasta they recommend which mostly ends up being a wide Fettuccine or Tagliatelle. The Fusilli pasta goes well with the ragus too. NOTE: They have multiple locations. Da Hong Pao Restaurant and Bar is a bright, basic spot offering a big menu of Chinese classics, with dim sum and a full bar. NOTE: They serve dim sum every day from 10:00 AM - 3:00 PM. Daikaya - Izakaya serves Japanese noodle soups ladled out in casual, funky digs with yellow and blue walls and rustic tables. Have only been there for their Ramen and want to go upstairs for their Yakitori. Dangerously Delicious Pies is a tiny, hip bakery serving sweet and savory pies along with quiches (including vegetarian/vegan options). My favorite by far is their lemon chess pie followed by their blackberry or blueberry or one of the mixed berry pies. NOTE: They have multiple locations and a food truck. DC Dosa serves dosas which are South Indian lentil crepes typically stuffed with a variety of fillings and toppings. South India has over 80 varieties of dosas with each family putting their spin on traditional recipes. They are an immensely popular street food staple in most of India. Dosas are vegan and gluten-free, as well as delicious and nutritious. DC Noodles * Looking forward to eating here. DC Noodles serves a vast variety of classic noodle, and other Thai dishes are featured at this contemporary neighborhood fixture. DCity Smokehouse * Looking forward to eating here. DCity Smokehouse is a hip BBQ spot serving sandwiches and combo platters. Plus, veggie sides, beer, wine, and bourbon drinks. District Doughnut * Looking forward to eating here. District Doughnut is a cute bakery specializing in classic and unique flavors of gourmet yeast donuts. The hand-craft their doughnuts from scratch daily without preservatives, using high-end ingredients like King Arthur Flour and Argentine Dulce de Leche. They prepare their dough, toppings, glazes, fillings, and batters in-house. The menu is carefully curated by Chef Christine and features a mix of our signature flavors and creative seasonal twists. NOTE: They have multiple locations. Donburi * Looking forward to eating here. Donburi is a Japanese restaurant providing rice bowl dishes in a compact, minimalist space with counter seating. Duke's Grocery * Looking forward to eating here. Duke's Grocery is a comfy, East London-inspired hangout offering farm-fresh cuisine and craft cocktails on two levels. Been hearing and reading about this place from a few different sources so figured I better add to my list. Eastern Market is a bustling marketplace since 1873 featuring a variety of produce, handmade crafts, and prepared foods. Great place to walk around during the summer to see all the fruits and vegetables, along with antiques on Sunday mornings and other arts and crafts on Saturday's. Ebenezers Coffeehouse * Looking forward to eating here. Ebenezers Coffeehouse is a casual, church-owned coffeehouse featuring fair-trade coffee and tea plus live music on some evenings. Elle * Looking forward to eating here. Elle is a cafe, bakery, restaurant, and bar. They also house a wholesale bakery, Paisley Fig. During the day, they are counter service, serving coffee and rotating baked goods, sandwiches, and pastries. At night, they turn into a full-service restaurant and bar, but you can still swing by and grab some bread and desserts from the counter. Falafel Inc is the world's first quick service restaurant (QSR) social enterprise, serving up authentic falafel, hummus, bowls and sides for under $5. Every meal is shared to help refugees worldwide. The restaurant is the brainchild of Ahmad Ashkar; an investment banker turned social entrepreneur, who grew up as a barbecue-loving son of Palestinian immigrants in the Midwest. He always thought a falafel shop would be in his future — just maybe not this way. Fare Well Bakery Diner Bar * Looking forward to eating here. Fare Well Bakery Diner Bar is a veggie-forward retro-chic diner, bar, and bakery which serves breakfast all day, along with bistro fare, and cocktails. Farmbird * Looking forward to eating here. Farmbird is a chic counter-serve for boldly flavored chicken plates or sandwiches and farm-fresh sides. Farmbird wants to change the way that people think about chicken. By combining the rare pleasure of a perfectly roasted chicken with the bold flavors. The Florida Avenue Grill has been open since 1944. It's a no-frills diner slinging large portions of down-home Southern classics. When it Ate there, I ordered the smothered pork chops with two sides which were the mashed potatoes, okra, and tomatoes along with an additional side of collards. The pork was so tender the meat came off the bone with a fork. There was enough food I took half home for a second meal. Founding Farmer's * Looking forward to eating here. Founding Farmer's is a co-op-owned American eatery dishing out market-driven comfort cuisine along with rustic-chic style. You should give the pickled vegetables, deviled eggs, and cast iron skillet cornbread with corn kernels in it and then for dinner the Chicken Fried Steak with a Jefferson Doughnut (square croissant-doughnut filled with custard). NOTE: They have multiple locations. Good Stuff Eatery is a casual, multilevel upscale-industrial spot serving gourmet burgers, fries, shakes, and salads. Their five napkin burger is the best. It has all kind of things but is topped off with an egg over easy. NOTE: They have multiple locations in the DC area. Gorsha Ethiopian Eatery serves Ethiopian classics retooled for counter-service in customized bowls and injera pockets, with toppings. You need to try the Gorsha Bowl with Berbere chicken, yellow split peas, spicy string beans and carrots, pickled shallots, marinated tomatoes, topped with injera crisps and white honey sauce; all served over turmeric rice. Granville Moore's serves gourmet bar food like Mussels and Frites (French fries) along with a diverse beer list served in a pocket-sized space. You need to try the blue cheese mussels or the tomato sauce and sausage mussels. Plus, make sure to order Frites and different types of mussels so you can share. The big question once the food comes to the table is which direction are we passing the bowls. Great Wall Szechuan House * Looking forward to eating here. Great Wall Szechuan House serves Pan-Chinese fare with a spicy Sichuan focus in a no-frills storefront. GW Delicatessen * Looking forward to eating here. GW Delicatessen is an unpretentious neighborhood deli featuring an array of sandwiches and other staples. The breakfast sandwiches look to be great for grabbing and going. Portions are piled high, and ingredients are prepared fresh daily. Hill Country Barbecue Market serves Texas BBQ and beer served in a rustic-chic, cafeteria-style setup, with nightly live music downstairs. The things I order here the most are their smoked sausage, smoked turkey, along with brisket and a side of cornbread and a side of Texas Caviar (black beans with a bit of red and green bell pepper and Italian dressing). Indigo serves bold flavors, and Indian favorites are served in a kitschy, cozy space with a large patio. Enjoyed the Dahi Lamb and Spicy Goat dishes which each came with Jasmine rice, fresh chopped herbs, along with spicy curried chickpeas. The roasted eggplant with potatoes is another dish that I liked a lot. Next time I need to go with a large group so we can order more food and can try more things. Izakaya Seki is a trendy option for Japanese small plates and noodle dishes, plus sizable beer list in minimalist digs. Try the monkfish liver if they have any it's like Foie Gras. Jaco Juice and Taco Bar is a juice bar serving health-minded breakfasts and Mexican street food in upbeat surroundings. They can make any burrito into three tacos which are huge and can be made into four or five comfortably. You should order the Hot Mess burrito which is scrambled organic eggs, sausage, potatoes, roasted red peppers, caramelized onions, and blended cheese. I enjoyed the fish taco which has North Atlantic cod, pineapple salsa, cabbage slaw, roasted poblano crema, and tomatillo salsa along with a Baco Taco that contains chunky guacamole, sauteed onion, pico, sweet corn, cotija cheese, roasted poblano crema, and tomatillo salsa. Jaleo is a buzzy Spanish spot from chef José Andrés serving tapas, paella, and sangria in a striking, artsy space. If you can convince your table you should get the tasting menu which comes in three level/number of dishes. NOTE: They have multiple locations in the DC area. Jimmy T's Place * Looking forward to eating here. Jimmy T's Place is a quirky, no-frills dining room serving American breakfast and lunch inside a Victorian structure. I keep meaning to go here but never think of it I've already eaten when I'm nearby. Jinya Ramen Bar * Looking forward to eating here. Jinya Ramen Bar is an outlet for the LA-based Japanese franchise known for long-simmered noodle soups, wide menu, and drinks. Keren Restaurant and Coffee Shop * Looking forward to eating here. Keren Restaurant and Coffee Shop serves East African cuisine draws expats and locals to this upbeat hangout from breakfast until night. I noticed this place one warm, nice evening in the spring and it had a line out the door so I figured I need to try it out when I get a chance. La Colombe Coffee Roasters is a trendy cafe serving house-brand artisanal coffee, pastries, and snacks in a sleek space. If you like very dark chocolate hot chocolate, this might be the place for you. NOTE: You will probably have to walk in because there is not much if any parking back in the alley. They have multiple locations. Maketto is a food and fashion marketplace featuring java, street food and fashion from DC-based businesses. For lunch, you should order the Cambodian Num Pang Sandwich (similar to Bahn Mi), the Leek Buns, and the Pork Steamed Bao. For dinner, you need to order the Spicy Laab over bone marrow, and I see everyone ordering the Maketto Fried Chicken and Bread. I haven't found anything I wouldn't order again. Market Lunch is famous for the blue buck blueberry pancakes and a breakfast sandwich called the Brick (fried egg, cheese, potatoes, and meat (sausage, bacon, etc.) on a soft roll.) I tend to order the sausage brick and a small lemonade. One of these days I will branch out and other things or get others to come with me so we can share. Masala Art * Looking forward to eating here. Masala Art is a classic Indian eats alongside hard-to-find items offered in a basic dining room with a lunch buffet. NOTE: They have multiple locations. Mason Dixie Biscuit Co. offers homestyle mains, such as our signature fried chicken biscuits; Benton's bacon, egg and cheddar biscuits; rich, traditional country-style sausage gravy; mouth-watering chicken pot pie gravy; nectarine, pink peppercorn jam, and cracklin’ butter spreads; as well as low-country sides, like collard greens and Hoppin’ John. Biscuits and fried chicken star at a relaxed eatery that updates Southern staples in a former chain place. I've had their biscuits when they had the pop-up in Union Market, and now I have had their deep fried chicken breakfast biscuit too at the new store. Meatball Shop * Looking forward to eating here. The Meatball Shop serves a seasonally-focused menu, five types of meatballs, selection of sauces, veggie sides and handmade ice cream sandwiches. The DC shop is the company’s first venture outside the Big Apple. At the shop, you can mix-and-match seven balls and sauces. Orders range from 'naked' cups (four with sauce, cheese and a side of focaccia bread) to 'baller' plates (on bowls of pasta, polenta or mashed potatoes). Meats and Foods serve grilled sausage sandwiches, and chili served in a small storefront with a retail market space. I stop there over a year ago and can't quite remember what I ordered, but I had to narrow the choice down to only two from a handful that I wanted to eat. Momofuku CCDC is a David Chang offers his inventive takes on Asian fare at this airy, modern outpost next to Milk Bar. They recently updated the menu and moved away from serving mostly Ramen. Naan and Beyond is a takeaway, and counter-service Indian meals draw fans to this popular, bare-bones spot. Make sure to get the veggie samosas with your meal or as a meal on their own. I've had both their lunch chicken biryani and lamb biryani; the portions were huge. NOTE: They have several locations around DC. Ollie's Trolley is a family owned restaurant which has been a Washington, DC institution for over 30 years. It's been voted best in town for their famous seasoned burgers and fries. Unfortunately, Ollie's Trolley has no trolleys, but this local fixture is filled with kitschy antiques and plays 50's style music. Panda Gourmet has basic cafe surroundings with a full bar where spicy Sichuan fare comes from a big menu. You need to order one the Chinese burgers along with the dumplings and pork belly appetizers. Plus, it's located at the Days Inn Washington DC/Gateway in Northeast Washington, DC. Pearl Dive Oyster Palace * Looking forward to eating here. Pearl Dive Oyster Palace is a popular spot for seafood dishes with boardwalk decor and a lively upstairs bar and bocce court. Friends say they server the best Bloody Mary in DC. Peregrine Espresso is where serious coffee sippers converge on this snug spot for carefully made espresso drinks, snacks and more. Great place to grab a coffee or a hot chocolate before wandering around Eastern Market on the weekend. They will go well with some food from one of the vendors at Eastern Market. NOTE: They have multiple locations. Peregrine Espresso at Union Market is considered by coffee connoisseurs as the premier place to go for a cup of delicious, micro-brewed coffee. A wonderful place to grab a coffee, espresso, or hot chocolate to go with your food from the dozens of food choices in Union Market. NOTE: They have multiple locations. The Pig has barn wood on the walls matches the hearty barnyard cuisine at this pork-centric New American eatery. They have so many wonderful dishes to choose from. Some of my favorites are the thinly sliced beets with goat cheese between each layer. Other appetizers to get are an order of the 'Face Bacon' which is fatty cut with cocoa strawberry jam, baby greens, onion marmalade or the 'Pork Belly Buns' with braized heritage pork belly, pear, and pickled cucumber. Pho Viet is a neighborhood eatery serving classic Vietnamese fare on the ground floor of a brownstone. If you like dishes spicy, you should order the lemongrass Pho that comes with additional chili oil. POW POW * Looking forward to eating here. POW POW is an award-winning plant-based Asian, organic and kosher certified fast-casual restaurant located in the heart of the popular H Street, North East corridor of Washington, DC. Red Apron is a counter-service spot in Union Market practicing whole-animal butchery to make charcuterie and more. I have ordered the following sandwiches: the 'Porkstrami' sandwich which contains pastrami style pork, mustard aioli, bacon braized sauerkraut, pork jus on a sub roll and the 'Meatball' sub includes pork meatballs, tomato sauce, salsa verde, and Grana Padano on a toasted sub roll. All their other sandwiches are great that I have eaten. NOTE: They have multiple locations. Right Proper Brewing Company Shaw Brewpub and Kitchen serves house-made brews and Southern-influenced American eats in an industrial-chic space lined with murals. You should try the trout mousse appetizer or the deep-fried chicken livers with smoked bacon, mashed potatoes, and green beans or the pasta bolognese with chopped veg and sausage. Rose's Luxury * Looking forward to eating here. Rose's Luxury is an eclectic New American tapas menu crafted in a cozy, converted townhouse with an upstairs lounge. NOTE: From talking to the someone on the staff a while ago the best nights to go without waiting forever would be Tuesday and Wednesday night. Seylou Bakery * Looking forward to eating here. Seylou Bakery is a minimalist bakery for artisan breads and pastries made from locally grown grains, along with coffee, and teas. If you get a chance order their focaccia bread which is made with whole wheat. Shouk * Looking forward to eating here. Shouk is a Middle Eastern-inspired vegan sandwiches, dips, salads, and snacks in a stylish, counter serve. NOTE: They have multiple locations. Slim's Diner is a family restaurant and diner located in the historic Murrell building in Washington DC's close-knit Petworth neighborhood. Slim’s Diner has cherry red booths, counter stools in sunlit, brick, and tiled space backdrop which serves classic diner fare. I ordered their cheese omelette with hash browns, marbled rye toasted, and a side of pork sausage. Spoken English * Looking forward to eating here. Spoken English is Chef Erik Bruner-Yang’s eye-popping, Japanese inspired, snack bar, and wood-grill with communal table, in hip hotel. Spoken English is a Tachinomiya-style neighborhood space that is a standing-room only restaurant which welcomes open-minded patrons willing to engage in new interactions with neighbors, strangers, and friends alike. Spoken English brings back the lost art of conversation in a fast-paced city. Serving exclusive sake selections alongside classic and street style dishes from Asia until late night. Stachowski's Market is a butcher shop offering fresh and cured meats and cheeses, plus sandwiches along with roast chicken to go. You need to get the four meat grinder or the Braunschweiger: house-made liverwurst on rye with onions, mustard, and sweet pickles. Another of their great sandwiches is their 'Four Meat Grinder' (sandwich) which contains capicola, mortadella, salami, soppressata, lettuce, pickled red onion, tomato, provolone, hot peppers, and more. Steak and Egg Kitchen customers belly up to the counter or sit outside at this no-frills 24/7 breakfast and burger spot. It's a nice whole int he wall that always open. I need to get back here one of these days it's been a while if not a few years. SUNdeVICH is a converted garage which houses a counter-serve shop for creative sandwiches made from local ingredients. I have eaten their Madrid which is a chorizo sausage with chimichurri sauce a perfect roll. I ordered the 'Shiraz' which is beef tongue with mustard and pickled vegetables when I went to the restaurant. NOTE: They're located in the alley between N and O St. NW. They also have multiple locations. Takorean is a Union Market vendor providing fusion tacos and bowls with Korean-style BBQ fillings. The tacos are great, but you need to get their Korean taco bowl with half rice and half salad along with a soft boiled egg on top. NOTE: They have multiple locations. Teddy's Roti Shop * Looking forward to eating here. Teddy's Roti Shop is a family-run counter-service go-to offering West Indian rotis with various meat and veggie fillings. Thai X-ing is a small Thai spot that uses traditional recipes and offers chef's choice menus and vegetarian specials. Plus, you need to make a reservation because they don't take walk-ins. When we were there in the fall, they served us a roast pumpkin/squash soup that I still think about, along with some poached fish, and other flavorful dishes. NOTE: They have two locations, and this is the original. Thomas Sweets is a well-known dessert shop dishing up small-batch ice cream plus frozen yogurt and handmade chocolates. They have so many flavors if you can't find one you like you're not trying hard enough. Plus, they are open late even during the week. Timber Pizza Company * Looking forward to eating here. Timber Pizza is DC's wood-fired pizza, serving neo-Neapolitan pizza to the DMV (District, Maryland, and Virginia) area. Come check them out at their brick and mortar location in NW Washington or at their mobile oven at a location near you. They are an offshoot of roving flea market pie purveyor with Neapolitan pies and Argentinean bites like empanadas. Toki Underground is a popular but snug Asian-fusion eatery known for ramen noodle soups, dumplings, sake and cocktails. My favorite is to get the curry chicken Ramen with extra noodles and if you're extra hungry also add the pork belly. Or order some pan-fried dumplings or if they have their sticky and spicy Asian chicken wings get those to share with others. Toli Moli is a Burmese Bodega, a mother-daughter snack shop serving Burmese fare, South Asian groceries, and more. Had their daily special of curried catfish noodle soup and it was great along with a side order snack of toasted bread with chopped tomato and onion along with a fried egg and cheese toasted with what looked like a pesto butter. Unconventional Diner * Looking forward to eating here. Unconventional Diner is an industrial-chic bistro and bar with upscale comfort fare, coffee, pastries, cocktails, wine, and beer. Union Market is a warehouse-like food market with a host of artisans offering charcuterie, empanadas, gelato and more. There are so many places to eat here sometimes it's hard to decide what to get. Go with a group so you can order lots of things you can share which allows you to try things and know more for next time. Plus, they have different pop-up type places worth trying. The Well Dressed Burrito is a compact space with limited hours turning out classic Mexican fare for the weekday to-go lunch crowd. After waiting over a year finally made it about 15 minutes before they closed and ordered the pulled BBQ pork burrito with lettuce, rice, and cheese along with their medium sauce. NOTE: They are only open Monday through Friday from 11:45 AM to 2:15 PM. Zaytinya is another Chef José Andrés' that offers an innovative mezze menu inspired by Turkish, Greek and Lebanese cuisines served up in a sleek and modern setting. Building on Jose’s deep knowledge of Mediterranean cooking and years of research and travel, the menu features shared small plates of authentic and innovative fare, creative cocktails, and unique Mediterranean wines.